Lauren is an appreciated model. Linda requested a tattoo to represent her love for singing and music, and the fact that she could not make this dream come true. 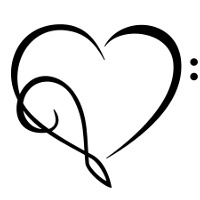 We thought of a heart made of a bass clef and a treble clef, where the latter is upside down to symbolize this impossibility.